Watch as Ted learns how to catch lobster in the Florida Keys with a little help from Bandito. Ted and his brand new Lobster gear. I went lobstering under the Vaca Cut bridge in Marathon, Florida with my wife and a friend. This was my first time going lobstering so I decided to pick up some gear in the Florida Keys. I bought just the essentials, an aluminum tickle stick and a plastic lobster gauge. My friend supplied the rest of the gear. The water was crystal clear which made spotting the lobster very easy. I dug under rocks with the the tickle stick and stuck my head in there to see what I could find. Since I was inexperienced I was mostly the spotter. All in all, we caught 9 legal lobster. We had some great dinners that followed that week. Beginners should definitely check out a YouTube video on how to lobster before going out. The gear was simple but effective! Products were made by a locally based company called Bandito Mfg. 9/25/12 A friend taught me how to use the Lobster gauge that I received from Bandito Mfg so that I could handle this very important detail on future Lobster outings in the Florida Keys. You would think that if you were measuring a Lobster it would be from head to tail, but in reality what determines the age and size of the Lobster is the upper body section. The legal size limit is 3” from the start of the tail (around mid-body of the lobster) up to right between the Lobsters horns. My wife knows A LOT about marine science and calls this section the “Cephalothorax.” It is pretty easy to use the Bandito yellow plastic Lobster gauge, which is already set to the legal limit. The purpose of measuring Lobster and making sure they are of legal limit is not to just protect you from getting fined or imprisoned, but mainly to protect people from abusing Lobster and taking the small ones before they are ready. Stay tuned for a video on how to measure a Florida Lobster, which are very different in appearance from their close cousin the Maine lobster. 10/2/12 Finding a good spot to go lobstering is harder than it looks. It would be a good idea to find a local company, such as Florida Keys Kiteboarding, that could take you out to their spots, rather than spending all day trying to find your own. Ideally, the water is crystal clear and you can simply spot a rocky bottom with a lot of crevices for Lobster to make their home in. Depending on how deep you want to dive for Lobster, seeing straight to the bottom might not be an option. The next best thing would be to have a GPS and a spotter. The spotter would ride behind the boat with a line attached to a dive sled, like the ones made by Bandito Mfg, it’s called a Sea Scanner Sea Sled. Once the spotter gives the OK, mark the spot on the GPS and dive down to see if you found lobster! 10/20/12 Lobster nets and lobster snares are two variations of lobster catching equipment that both have positives and negatives. 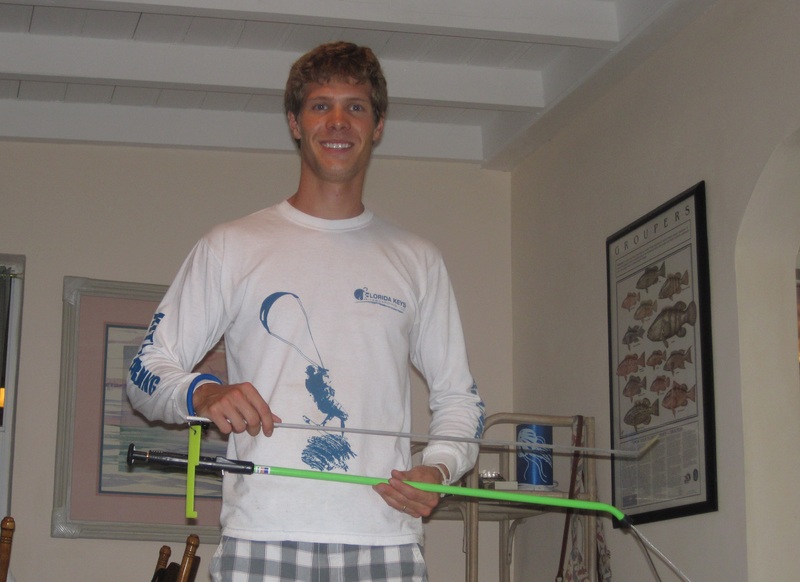 They can be purchased in many places in the Florida Keys, such as Florida Keys Kiteboarding in Marathon, FL. Lobster snares can fit into small holes and reach deeper than a lobster net. They are very effective and rarely let a lobster loose once it is snared. The downside to a lobster snare is that it requires precision, timing, and practice. The advantages of a lobster net are that you have a better chance of catching a lobster with less effort. A disadvantage is that it might be more time consuming because you have to tickle the lobster out into a large enough area where the net can be placed. The lobster net requires the use of a tickle stick. It would be very hard to position a lobster with a net so that it can be caught without tickling it first. 11/3/12 Fishing for Florida Lobster is a fairly inexpensive activity and the rewards could be huge! Imagine a lobster tail at Red Lobster for 15.00! That is for only 1 Tail and no sides! Monroe County, Florida allows a maximum of 6 legal lobsters to be caught per person. Let’s assume you go lobstering one day and catch your maximum number of lobster, which shouldn’t be too hard in the Florida Keys! For a beginner, you will need a saltwater fishing license and a lobster stamp. The saltwater fishing license is $32.50 at K-Mart here in Marathon, FL. The lobster stamp is an additional $5.00. Let’s assume you bought all of your equipment at a very low price from Bandito Mfg. in Marathon, FL for $20.00. Total cost of your gear and license is $57.50 compared to a daily catch worth of lobster at $90.00 that can be repeated for months! You pay off all of your expenses and save $32.50 the first day that you go lobster fishing versus going to a restaurant!